When I was younger I used to like wandering around the streets of London ( or where ever I might be) with my camera looking for interesting things to photograph, ‘street photography’ as it’s commonly known. Now I’m doing that again. I’m in the City of London quite often so now I look around for things to shoot when I’m on my way to a job, or scout out a location to go back to later. It’s something I stopped doing for a long time. I was just concentrating on earning money I guess, it’s an easy trap to fall into, but for a while now I have been shooting more stuff just for myself. Anyway here are a couple of shots, old and new. 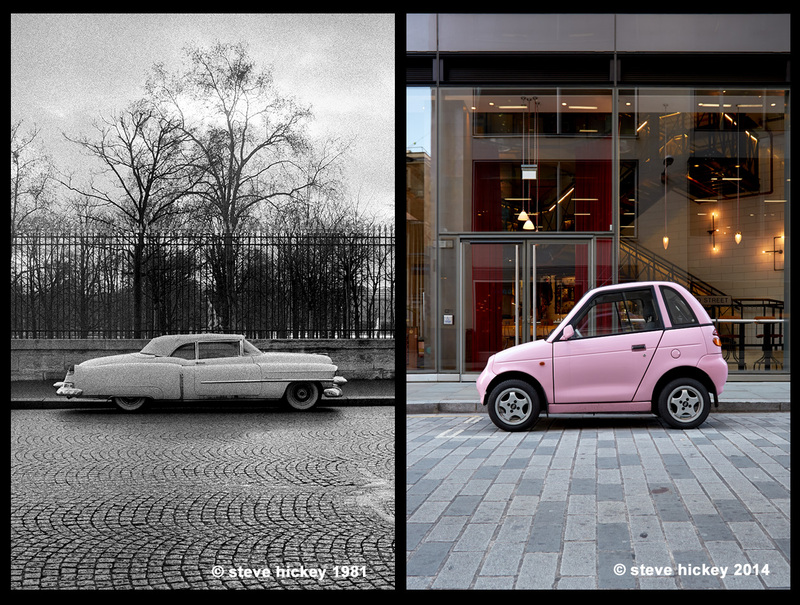 I have been scanning some old work recently and when I saw the little electric GWiz on the way to a job yesterday I remembered my Cadillac shot (Paris 1981) which I had scanned only a few days ago. Cars that are on opposite ends of the spectrum in just about every aspect. For the technically minded, the Paris shot was done using an Olympus OM -1 with a 35mm f2 lens, the GWiz with a Canon 5D3 and 24 – 105mm lens.